Less bread and more veggies is the key to this contemporary twist! Preheat oven to 400 degrees, using convection feature if available. 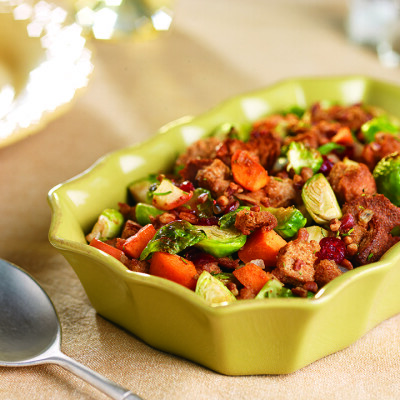 Place sprouts, yam, apple, onion, celery, rosemary, salt and pepper in a large roasting pan. Drizzle with olive oil and toss to coat. Roast mixture until veggies are soft and lightly brown. Remove pan from oven and lower temperature to 350 degrees. Add the remaining ingredients to the pan and stir to distribute. Cover pan with aluminum foil and return to oven for 30 minutes. Remove foil and turn oven setting to broil. Broil until top is golden brown, about five minutes.